The model 3SB offers the resonance and tone quality of a solid silver headjoint and body combined with the durability of a French key mechanism. With a B footjoint, silver headjoint and body, the 3SB offers specifications many teachers recommend as the ideal step-up flute for advancing musicians. 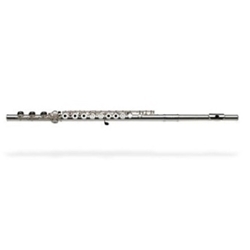 The B footjoint provides a longer tube allowing a greater resonance in the flute, as well as providing flutists opportunities to utilize alternate fingerings for greater facility in the upper register.